When it comes to plus size wedding gowns, how are you suppose to pick one that's flattering to your figure when they are pictured on small models? You will find that most manufacturers make plus size gown collections. But not all manufacturers use plus size women to model their wedding dresses. On this site you will see a few wedding gown designers who realize that plus size women want to see gowns on plus size models. Identify your body type and use the information to figure out which styles look best on your shape. Look at real brides. Find someone who is shaped simular to you notice their style choice and how it conceals or emphasize potential problem areas. Look at the dresses on the models. Sometimes you may notice that the model shape is similar to yours. This can help you determine how the gown will look on you..
"This dress style is best for the hourglass body type and large bust body shape. Rectangle body shape with waist cinching shapewear can make this work. " Do you look better in a V-neck, scooped, square or sweetheart neckline? Do you look your best in an a-line, empire waist, form-fitted, fit and flare or princess seam dress silhouette? What special ocassion or evening dress have you worn in the past that complimented your figure? Find a wedding gown with the style details that are flattering on you in other clothing, and this will help you with picking the perfect wedding dress for you! Wedding dress designer Bonny Bridals plus size line is the Unforgettable collection. These gowns can be ordered in sizes ranging from 18W to 32W. They are designed to fit the proportions and curves of the full figured woman. To help you further choose a wedding gown take a look at these gowns below. Do you see your perfect dress? "This is a mermaid style wedding dress with a very form fitted bodice. This dress is best for the hourglass, rectangle and large bust body shapes". "This one will work for the large busted figure, hourglass and pear shape body shape. The rectangle and apple body shapes may pull this style off with the right shapewear garments." "This one is best for the pear shape body shape because the off the shoulder styling and 3/4 length sleeves add width across the shoulders which balance the bottom section. This dress will also work for the large bust figure type and rectangle type since this is an a-line wedding dress style." "This dress is good for the apple body shape and rectangle body type because it's an a-line with style details that demphasizes the waist and stomach area. That side slit takes the attention away from trouble spots. This style will work for the large bust figure type also. " "This gorgeous ball gown bridal dress will enhance the pear shaped body shape and the rectangle shaped body. The hourglass body type can wear this dress but it doesn't show off body curves like other styles would." 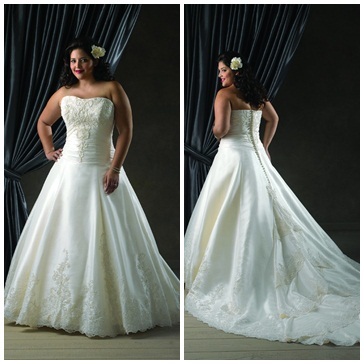 Hopefully you now can see that shopping for plus size wedding gowns can be easy! Designers of Wedding Dresses for Plus Size Women - Here is a list of designers who design wedding dresses for plus size women. 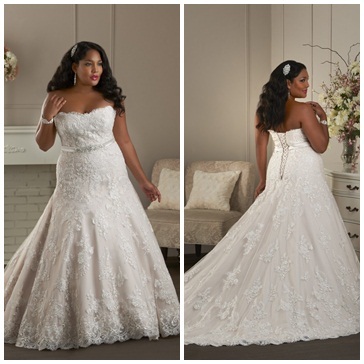 Plus size brides - Steps to picking a complimentary bridal gown. Need some basic fashion guidelines for plus size brides? . Plus Size Bridal Gowns That Flatter Your Body Shape Find out what body shape you have, which wedding gown styles will flatter your figure. How to order discount wedding gowns online? You saw your gown in a bridal shop, but it cost too much. What can you do to cut costs? Find out the do's and don'ts of ordering a gown online. Chinese wedding dresses Before ordering plus size wedding gowns from this source, read what other brides have experienced, both good and bad. "Here is a link to Weddingbe.com to a page where plus size brides sent in pictures of their wedding dresses. This may be helpful to see which styles are flattering to plus size figures."